Roderick writes lyrics that stand beside many of the best songwriters from any genre or era… Audience members, critics and peers alike all proclaim that they have not seen a performer like Libby Roderick since the 1960’s. Her adoring fans come to shows thirsty for solace, wisdom and humor and they do not leave disappointed. The poetry contained in Roderick’s lyrics is exquisite… Roderick has a love and passion for doing what she does that simply can’t be denied. And those who are fortunate enough to hear her will come away the richer for it. Strong writing, great musicianship, faboulous production. The energy of her music, like the best music of women’s and civil right movements, has the power to sustain and encourage us… Her music penetrates through numbness to reveal, affirm and inspire our lives. Libby’s ability to connect with and touch her audience is unsurpassed by any performer. She reaches inside to her audiences’ innermost being. Her acknowledgement of our pain in her music is balanced by a celebration of healing – in ourselves and in the world. After her sold-out debut performance in Rochester (in a house wth 460 seats, we squeezed in 520 people! ), we immediately asked her back for two performances just six months later. Libby Roderick is truly a tribute to the best in the human spirit. Libby Roderick is back with a vengeance… personal, universal, intense and witty. Her music is water to a thirsty soul. You can leave a Libby Roderick concert having faced some of the world’s worst woes and, perhaps, your own inner demons. But, instead of feeling beaten down, you feel as face has been brushed by butterfuly wings, and your heart feels someho bigger, wider. I have no idea how she does it, but Libby has a wonderful, profound, paradoxical effect on her listerners. I hope everyone will will have the opportunity to discover her music. 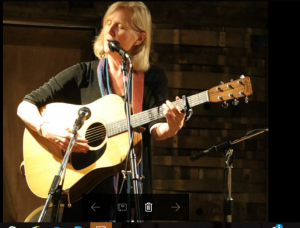 Libby’s engaging warmth, concerned passion and skilled songwritings healing and entertaining at the same time. She is winning devoted fans every time she plays here.